Did you know that you could increase the run time of your notebook battery by optimizing the power settings of your laptop? Yes, optimizing the laptop power settings and some other strategies of conserving notebook battery power can add extra hours to the run time of your battery. That is because operation at maximum performance requires more power where as with optimized power settings a trade off is obtained between the performance and power consumption. The notebooks have become thinner, smaller and lighter because of sleeker notebook battery designs. Thus this has been at the expense of large powerful long lasting batteries. This loss however is compensated by smarter power management options that accompany the present day laptops. Here we will mention some of the strategies that can save a lot of your notebook battery power. For more cool tips and tricks get in touch with us here at www.laptopstandboss.com! …and NO, there’s nothing geeky about them. They are very doable and you can implement them immediately. Dim the screen to the lowest level at which you feel comfortable while working. When you lower the screen resolution and colour depth the workload on the GPU decreases, thus increasing the battery run time. That jazzy background screen saver of yours is bound to consume more energy than a simple one. So try keeping a simple back ground theme. You can change the settings by going to Start/Settings/Control Panel/Display/Settings/System/Advanced/Performance Settings/ Visual Effects. Turn off the unused devices as they might consume power when they are turned on even though they are not being used. For example bluetooth wireless consumes notebook battery power even when not in use. Simillarly airport wireless consumes power despite of it’s features not being used to connect to a network. Disconnect peripherals when not in use. Eject CDs and DVDs if they are not currently being accessed. Disable the CD ROM’s auto insert notification. Turn off or reduce the frequency of auto save features. Disable automatic formatters, spell checkers and auto recalculate features. Turn off scheduled tasks. If you use scheduled tasks to run programs or scripts, or if you schedule other tasks to occur automatically at a preset time, specify that these tasks won’t be performed when the computer is running on battery power. To reach the scheduled task options follow Start/Settings/Control Panel/Scheduled Tasks or Start/Programs/Accessories/System Tools/Scheduled Tasks. Keep the use of tools in the notification bar to a minimum. The idea is to make minimal use of the CPU. Look at the notification area of the taskbar and close any tools (or utilities) that are unnecessary. Often, these tools are pre-installed on the computer. To make changes to the taskbar and the start menu go to Start/Settings/Control Panel/Taskbar and Start Menu. 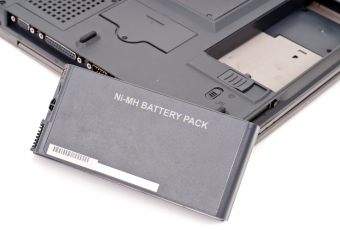 Notebook battery run time can be improved by reducing the hardware activity. Go for Defragmentation of your hard drive regularly. This optimizes the placement of data on the drive so that it could be found more quickly. It can be found at Start/Programs/Accessories/System Tools/Disk Defragmenter. Optimize windows paging file. It’s a part of the hard drive which serves as the memory whenever the RAM is full. To optimize it go to Start/Settings/Control Panel/System/Advanced/Performance Settings/Advanced/Virtual Memory and then change and set both the initial and maximum paging file size to 1.5 times the capacity of the installed memory. Every time Windows boots up, start up items load into memory. That causes other open applications to spill over into virtual memory and adds up to the CPU memory. The start up options can be disabled by going to Start/Programs/Startup folder. Remove the unnecessary background items. Add memory to your notebook. You can minimize the virtual memory reliance of Windows and reduce notebook power consumption by adding memory to your mobile PC. Windows includes certain power schemes that were created for mobile PCs in particular. The Portable/Laptop power scheme makes power usage minimum to conserve your battery, but then it adjusts to the processing needs so as not to compromise with the system speed. The Max Battery power scheme minimizes the notebook battery power usage but does not adjust to your processing demand changes. So use Max Battery only when you require minimal processing power. You can change the power schemes by going to Start/Settings/Control Panel/Power Options/Power Schemes. Standby and hibernate modes are two important power conserving features. Each has it’s own unique situation of application. Standby is energy conserving, because your laptop switches to a low-power state. Devices, such as the monitor and hard disks, turn off and the notebook/laptop uses less power. Standby leaves applications and files open on your desktop. Standby is perfect when you’re taking a short break. One important limitation with the standby mode is that everything stays in memory but is not saved to the hard drive. Hibernate mode writes an image of the current work on to a special file on the hard drive, and then shuts your notebook almost completely off. It takes a bit longer than standby, since it writes to your hard drive. Hibernate also takes a bit longer to resume, since you must go through essentially the normal boot process. When you start it back up, you’ll see everything as you left it. Hibernate is the perfect mode for shutting down for the night or even the weekend.